Look, I know there's this underground movement trying to get Monster Hunter going in the West, but most people - myself included - just aren't feeling it. Mostly that's down to the combat and reliance on party multiplayer, but I'm starting to wonder if the game's looks don't have something to do with it. At least, that's all I can think of as to why I suddenly want to play this mock-up of a Game Boy version done by British artist Gary Lucken (who we've featured before). That and "Stabasco", which is marvellous, and should be trademarked immediately. 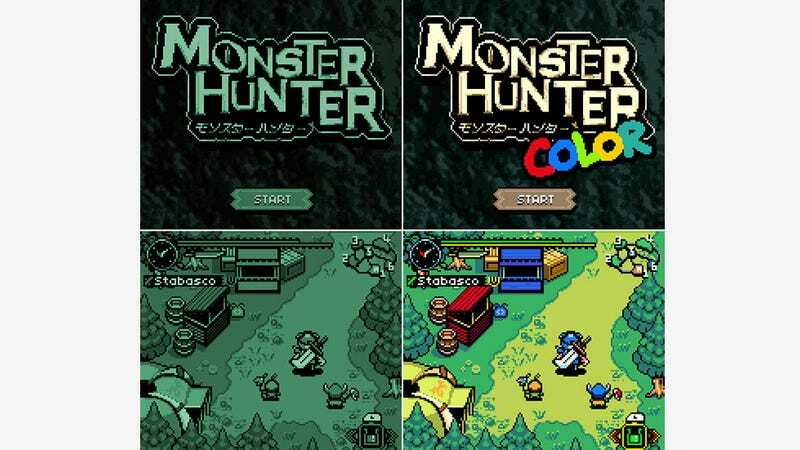 He's even done two versions, one mono, one GBC! Thoughtful.